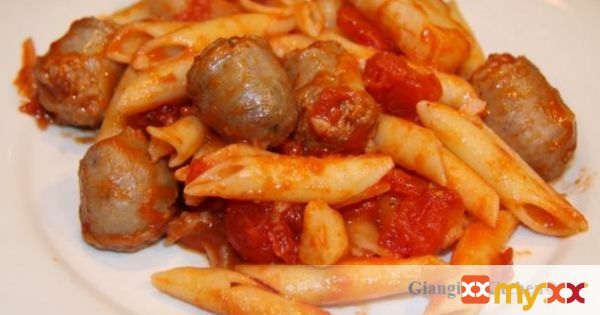 Penne with sausage, tomatoes and potatoes. Simple and easy and nothing to it. 1. In a large pot add the potatoes and salted water. Bring the water to a boiling and cook the penne pasta until they are al dente. 2. Meanwhile in a large deep skillet heat 1 tablespoon of the olive oil until warm, but not smoking. 3. Add the sausage to the skillet. Cook on medium high heat until nicely browned and cooked through. About 5 minutes. 4. Add the tomatoes and cook over medium low heat. 5. Add the pasta and potatoes to the skillet and add the butter and cook stirring until the pasta is well coated. 6. Transfer to bowls and serve right the way.